This is a tale of little Warren Wilson College in Buncombe County, NC, and a Republican candidate for County Commissioner down there who lost her race to a Democrat by 13 votes. The losing Republican went to a special meeting of the Buncombe County Board of Elections last night and made her case that 44 votes cast on the Warren Wilson College campus in her race should be thrown out. At one point, an attendee in support of [the losing Republican] looked back at a group of Warren Wilson students in the packed meeting room and flashed a piece of paper on which she had written, "You are a law breaker." The hapless Republican lost the vote in the Buncombe BOE and intends to appeal to the state BOE. The stakes are substantial. If this commissioner district goes to the Democrat, that will give the Democrats a 4-3 majority on the Buncombe County Commission. I'm amazed there have been no comments here, with all the ASU haters around here! Few people fail to recognize the students have a right to vote. 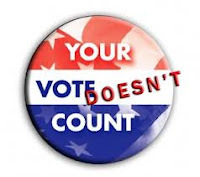 They do recognize they should have a driver;s license that reflects their local address as per state law and that the early voting is fixed to cater to their vote because they are mostly liberal. Dem12, do you like what ASU did to Jerry Moore? "More of an Ideology Stand Than Anything"
NC Universities, Better Buckle Your Seat Belts! How Did Watauga County Vote? Schmidt: "Voter Fraud Really Doesn't Exist"
You can see the video footage here. Enjoy!